I would like to take a moment of your time to introduce a complimentary service I provide for all of my clients. 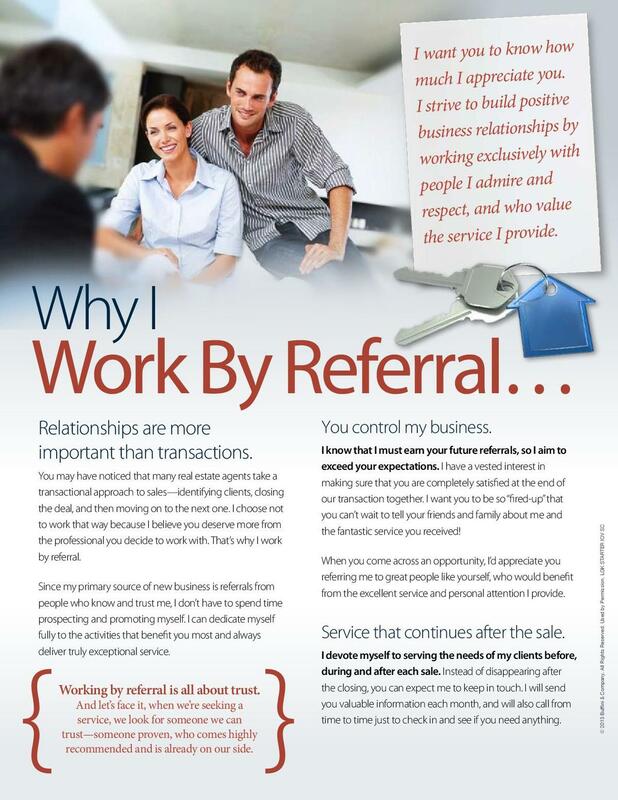 My Client Appreciation Program is part of the commitment I have made to run my business exclusively by referral. Every month I send information that I believe my clients will find useful. This first piece explains how my decision to work by referral benefits you. It allows me to devote my time and energy to meeting the needs of my clients. There are a number of ways that I can be a valuable resource to you, such as providing market updates and referring other reputable professionals when you need them. I make a constant effort to provide my clients with excellent service, because in my business, the most profound assets I possess is their respect and trust. I am always here to help them. If you would be interested in signing up for my Client Appreciation Program, navigate to the "Contact" tab, fill in the appropriate info and include the word CAP and your mailing address and I will add you to my database. Oh, by the way…if you know of someone who would appreciate the level of service I provide, please call me with their name and business number. I’ll be happy to follow up and take great care of them.